The 9th annual Wicker Park Green Music Fest took place in blazing hot weather this weekend. The event prides itself on being eco-friendly. According to their website, the event is “green” because it has easily identifiable compost and recycling bins, strict no-plastic and no-styrofoam requirements, and some vendors with eco-friendly products. 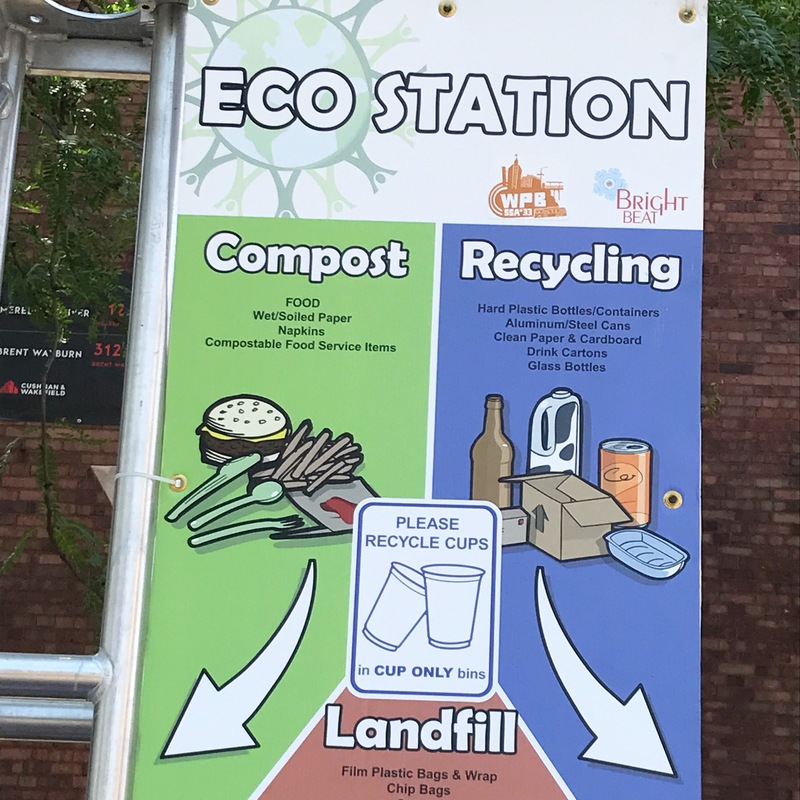 I did see very clear compost and recycling guidelines at “Eco Stations” around the event and most vendors clearly complied with the plastic and styrofoam requirements. Out of curiosity, I peered in the trash bins. In general, it looked as if people had adhered to the rules on the signs. All food service ware (plates, trays, utensils, etc.) must be certified compostable. On top of a clear recycling and compost plan, the festival also had a stage powered by bikes! Anyone at the event could hop on and create energy. I asked a staff member at the event what percentage of the stage’s required energy the bikes produced, but he was unsure. Though the event did have strict requirements for how vendors served food to customers, most of the vendors at the event were not sustainable companies. A few were, including a local cleaning product company called Meliora. Some vendors had tags on their tents saying “Green Vendor.” Event staffers put the tags up to differentiate between the vendors that adhered to the green requirements listed above just for this event from the ones that were sustainable, local, fair trade, or eco-friendly outside of this two-day event. Any company without a “Green Vendor” label still adhered to the no-styrofoam and no-plastic rule but was not necessarily sustainable otherwise. I would love if the festival put more of an emphasis on showcasing sustainable businesses next year. While it was exciting to learn about companies like Meliora, it was frustrating to see a “green” event filled with energy drink companies and a dude selling cow skin rugs! The cow skin rug man claimed that his products were sustainable because he used the whole cow in his process. Personally, I don’t believe animal skin rugs are sustainable or moral. I wish the Green Music Fest had showcased more eco-friendly vendors. I was impressed by the event’s ability to help people compost and recycle, but without showcasing local, sustainable, businesses, the event fell short of what a “green” event should look like. What is a “green music fest” with only a few eco-friendly vendors? Why didn’t they showcase more city-wide sustainability efforts? Where were the local businesses that put the environment first? And why the heck was the cow skin man there? This is a great event. I love anything that puts sustainability first. I just hope that next year, the event planners find and showcase more of Chicago’s eco-friendly businesses. I wish I could have gone! But you make great points. Thank goodness Meliora was there at least.